This glittering tribute to the prime hours of the day is inspired by the color of the sky just before dawn. Inspired by the color of the sky just before dawn, Eileen Baumeister McIntyre created this glittering tribute to the prime hours of the day. 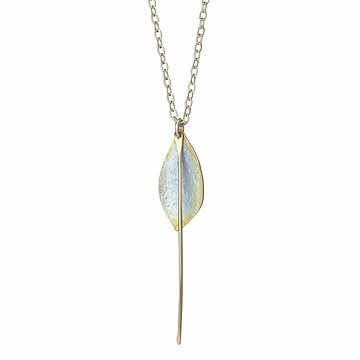 She shapes a sliver of sterling silver into a delicate petal and adds an iridescent layer of glass enamel. The center of the pendant shines with a barely there pale blue hue and the edges gleam with soft gold. A swooping strand of gold cuts like a radiant sunbeam through the pendant's center. Handmade on Long Island, New York. “The shapes and textures of flowers, petals, seeds, vines, and leaves” are what stimulate Eileen Baumeister McIntyre’s creativity. Fortunately, she is able to find natural inspiration aplenty in the extensive organic garden that surrounds her Long Island studio.